Recently my friend Ed and I were paired with a stranger and he asked us why we were keeping track of our putts. We brushed it off at the time with some flippant remark about it just being a thing that we do but it got me thinking. Why do I count my putts? It makes no difference to my total score so why do it? The answer is simple. 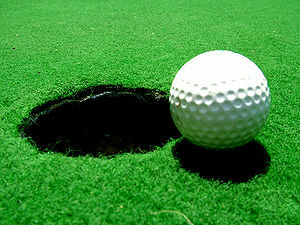 I count my putts to find out how well I am striking the ball. Say, WHAT? Let me repeat that, I count my putts to find out how well I am striking the ball. Allow me to explain. In the old days, (never mind how long ago) score cards actually had a space in the top right corner of each little square for marking your score on each hole. You’d tell your playing partner that you had a “42” or “53” or “#1” on that hole. The first number represents your total score on the hole. So in the example “42”, the 4 represents your total score on the hole and the 2 would represent your number of putts on that hole. Fine, now you understand how it works and even though the vast majority of golf courses no longer print their score cards that way, I still keep track of them that way. All of which brings us right back to the question of why I count my putts and how does that relate to how well I am striking the ball? Getting back to Ed. This past Thursday he was struggling with his game. Ed is basically a bogey golfer who is usually good for 4 or 5 pars a round & enjoys that as a good day. His first 6 holes on Thursday were a struggle for him but he sunk an unexpected 30 foot putt for birdie on the 7th hole and his game started to come around. At the end of what he felt was one of his worst rounds of the year he was amazed to find out that he shot 16 over par with 5 pars and the aforementioned birdie. He had one of his best rounds the week before & was 13 over par and happy about it. He had 5 pars then too. He also felt that I shot one of my best rounds of the year as I was only 6 over par and 5 strokes better than the previous week. When I got home from the course I checked out the two cards and used the number of putts to analyse the two rounds and found out the following. Ed was right. Taking his previous week’s score and subtracting his putts (35) left 40 strokes from tee to green for 18 holes or an average of 2.22 strokes per hole. Thursday he used 47 strokes tee to green but only scored 3 strokes higher because he only had 31 putts compared with 35 the week before. Ian was one of the first people to follow my blog, probably because I used a positive visualisation golf analogy in my business blog. So there you have it. I count my putts to find out two things. How well am I striking the ball from tee to green and how well am I putting? Go practice your putting as that is far and away the easiest way to shave strokes off of your game.